Too often these days, parents feel they have no choice but to pack their child's schedules with adult-supervised, adult-driven activities such as organized sports. But, as a report from the American Academy of Pediatrics (AAP) makes clear, such activities should not come at the expense of free and unstructured play, which is critical to healthy child development. The overriding premise of the report is that "play (or some available free time in the case of older children and adolescents) is essential to the cognitive, physical, social and emotional well-being of children and youth." When play is controlled by adults - such as in organized sports - children have to follow to adult rules and concerns (like winning) and lose some of the benefits play offers them, particularly in developing creativity, leadership and group skills. Free, child-driven, creative play protects against the effects of pressure and stress. Editor's Note: Recent research  at Loyola University Medical Center in Chicago suggests another benefit of free, unstructured play: that children who spend more time in free, unstructured play suffer significantly fewer overuse injuries. Remember that active child-centered play is a time-tested way of producing healthy, fit young bodies. 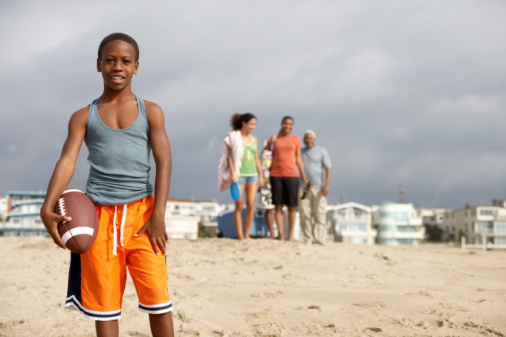 In fact, a 2010 study recommends "informal physical activity in home or neighborhood settings" as one of the ways for kids to get the 60 minutes of moderate- and vigorous physical activity experts say they need each day (an amount, the same study shows, our kids are not getting solely from participating in organized youth sports). Promote balance by resisting the temptation to allow their children to specialize too early  - such as in a particular sport or musical instrument - to the detriment of having the opportunity to explore other sports and other areas of interest. My advice, like that of the AAP, is that simply because our culture seems to increasingly devalue free time doesn't mean you should. Kids need to grow up comfortable with silence. Your intuition tells you how important free time is. It tells you not to interfere with a child's play unless someone is about to or is being hurt. Have the courage to say no . Be honest with yourself and your children. Instead of feeling guilty and worrying that if you don't do everything possible, don't go the extra mile, your kids will suffer, will be deprived, or will fall behind their peers, understand that sometimes the best thing a parent can do for a child is nothing. Children are not miniature adults - there will be plenty of time for them to be stressed and overworked when they actually are adults. In short, don't forget to let your child be a child. Brooke de Lench is the Executive Director of MomsTEAM Institute, Founder and Publisher of MomsTEAM.com, author of Home Team Advantage: The Critical Role of Mothers in Youth Sports  (HarperCollins).